Hours: May 12 – July 1 (bloom season): Saturdays and Sundays from 10 a.m. – 3 p.m.; Nov. 3 – Dec. 9 (Annual Holiday Boutique): Saturdays and Sundays from 10 a.m. to 3 p.m.
Products: Bywater Hollow Farm is owned and operated by the Bunz family. 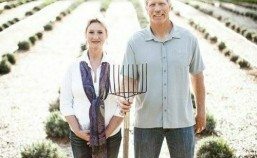 Located on the Placer County Wine Trail our farm is open seasonally to the public for U-pick while the lavender is in bloom from mid-May through June. Our farm shop features our own handcrafted, homemade products as well as many other fun lavender themed items. Additionally, we open the farm for engagement and family photo sessions as well as small group tours year-round by appointment. And don’t miss our Holiday Boutique on weekends in November and early December, featuring our own beautiful lavender inspired products as well as unique and special gifts from local artisans.